The System Menu panel contains main UNIGINE engine settings and can be opened by pressing Esc. 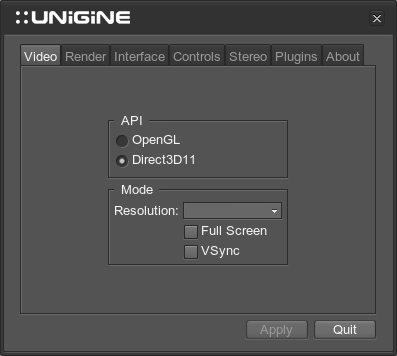 The Sytem Menu is available only when the UnigineEditor isn't loaded. To apply changes, click Apply. Antialiasing — choose the antialiasing mode or disable it at all. Interface Language - specifies the language to use in the interface. Settings of this tab take effect if one of the supported stereo modes is used. The settings are described here. Show debug info - shows debug information on the master and slaves. It includes the number of synchronized nodes and materials, a name of the view, the number of connected slaves (on the master computer), and others. Show projection configuration - enables the projection setup mode. AppWall / AppProjection - settings of this section take effect if the AppWall, AppSurround or AppProjection plugin is used. The settings are described here. To open the Projection Configurator, click Projection. This option is available only for projects with the AppProjection plugin loaded. The tab provides information about the Unigine team participated in engine development.